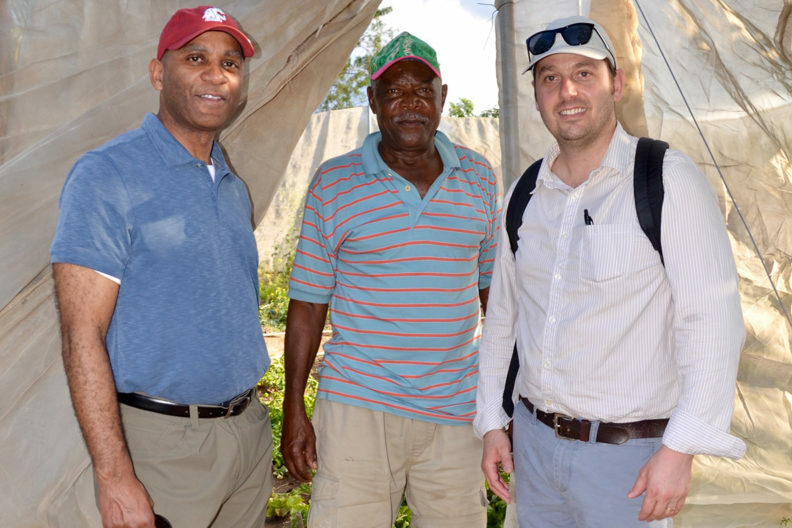 WSU Everett Chancellor Paul Pitre, local farmer Don Neri, and WSU Extension’s Anthony Gromko, l-r, pose in Neri’s pilot garden. The garden is part of a project to establish small greenhouse gardens for subsistence farmers around the city of Dajabón, Domincan Republic. Farmers around the city of Dajabón, Dominican Republic, are mostly subsistence farmers, only able to grow enough food for themselves and their families to eat. WSU researchers, in partnership with the Rotary Club of Everett, are working to help those farmers increase their harvest so they can sell their produce at market. Last month, Gromko and WSU Everett Chancellor Paul Pitre visited Dajabón, a city of around 35,000 along the border with Haiti, to meet with local nongovernmental organizations (NGOs) and professors from Universidad ISA, an agricultural university about three hours away. Ed Peterson represented the Rotary Club of Everett on the trip as well. The program will work with farmers all around Dajabón province, which has a population of around 70,000. The duo laid the groundwork for collaborating with various groups to implement the program, which will require the use of microloans to fund the farmers’ gardens, Gromko said. The Everett Rotary Club initially paid for 10 pilot gardens for farmers around Dajabón, just to see if the project could work. Gromko and Pitre toured those 10 pilot gardens and talked with farmers about their experiences using them, Gromko said. Gromko, Pitre, and fellow WSU Extension colleague José García‑Pabón are working on a grant from The Rotary Foundation to establish the microloan fund, Gromko said. The WSU faculty members also talked with Universidad ISA faculty about setting up a Memorandum of Understanding (MOU) to facilitate a student exchange program and a research component for the garden project. WSU Extension’s Anthony Gromko (white hat) talks with local farmer Dona Manuela in her garden, a pilot project funded by the Rotary Club of Everett. WSU Everett Chancellor Paul Pitre (crimson hat) chats with Rotary Club representative Ed Peterson in the background.